I say this every year but I think this may be the last year I make Christmas cards. Not because I don’t like making them but because there are so many great designs out there right now that *I* want to buy. What a great pitch this is for a post where I am about to write about how you can make your own (I’d blame the spiked eggnog but I haven’t reached that far into the Christmas season as I type all this). These cards stemmed from a very late night crafting session with our 7 year old daughter, who is on a huge drawing and crafting bender. The biggest reason I use Mod Podge instead of regular craft or school glue, is because it dries faster AND it dries clear. So if you make an error, it’s much more forgiving. Start by punching out a bajillion random shapes using your paper punches. Then take your paper punch pieces onto the card stock in the shape of the tree pattern. Lay out the big heart pieces first and then fill the spots with the smaller ones. When you are happy with how it looks, use your Mod Podge and paint brush and glue the paper punch pieces onto the card stock. The reason I always do a layout first, is that sometimes the way you think it’s going to look, doesn’t always wind up being the case. Also a quick tip on making sure all of your “tree” shapes are identical on all the pieces of card stock, put a finished card on the left of the card you are working on and line up your bottom row of hearts first. That way everything is the same height and size and work up from there. We may or may not have made a big mess. I know. Super exciting Saturday night! But they turned out pretty cute! And Mother’s Day cards (though really these could be for any occasion). If you have any questions, as always, don’t hesitate to ask in the comments. But wait! Do you want more Christmas craft ideas? 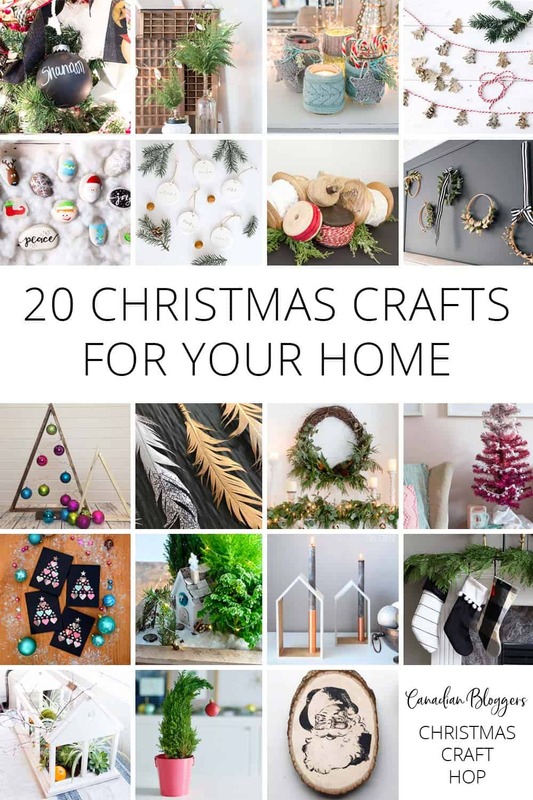 Go and visit all of these amazing and talented Canadian Bloggers in our Christmas Craft Hop!! You are the card making queen!! I love these…I haven’t bought cards yet, but now I feel inspired to make a few special ones of my own for family. I have so much scrapbook paper just waiting to be used! YOU are amazing! I can’t even deal with this! These are sellable lady, you should be selling your cards! and wreaths! Goodness – you are so good! These are so pretty. Love how graphic they look with the black cardstock. Great job! I used to make cards every year when I was into stamps and embossing! Love these! Most recently I discovered those shape punches – LOVE them!